The Leafs are mired in a classic Toronto death spiral, seemingly caused by a combination of the pressure from the impending trade deadline and being involved in the slightest of playoff races. Not exactly heavy stuff. The team once held the 7th playoff spot in the Eastern Conference, but are 1-7-1 in the last nine games dropping them to 10th, three points out of the final playoff spot. You read that right, the Leafs have three points in the last nine games and are still in the thick of a playoff race. The Eastern Conference is a joke. 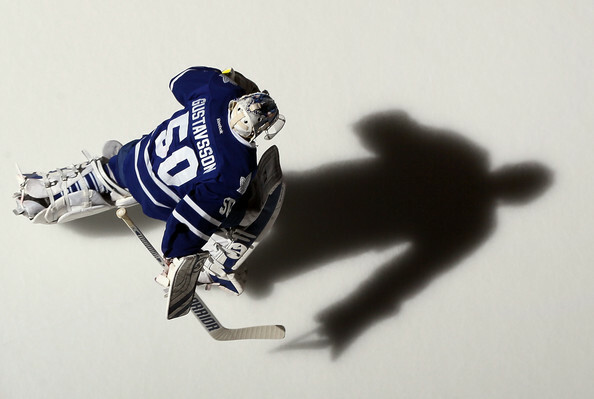 Unsurprisingly, the late season swoon has brought Leafs Nation to the edge, ready to jump. Solutions range from the mildly plausible (fire Ron Wilson), to the downright insane (TRADE EVERYBODY, BLOW IT UP, AND BURN THIS CITY DOWN). Obviously, it is a concern that the Leafs are doing terribly under minimal pressure, which also leads to the conclusion that the late-season runs of previous years were a product of zero expectations and no pressure. Yet it's important to remember that the Leafs are one of the youngest teams in the league and rebuilding takes time. I'm not trying to make excuses for a truly awful February—there obviously are major problems that need correcting—but just because young players are not paying dividends now, does not mean they will fail to develop into a strong core moving forward. Fans are ready to make almost any trade, so long as the upgrade is immediate, although not necessarily long-term. James Reimer has lost his God-like status in Toronto, and the only other player under the bus as much as him is Luke Schenn. Players in the AHL aren't immune to the hyper-reactivity either. No trade proposal is complete without the names Nazem Kadri or Joe Colborne. Apparently, the kids are not alright. Everybody wanted a rebuild, but now nobody wants to go through the growing pains. As hard as it might be for a passionate fan base that hasn't made the playoffs in eight years, patience is still required. 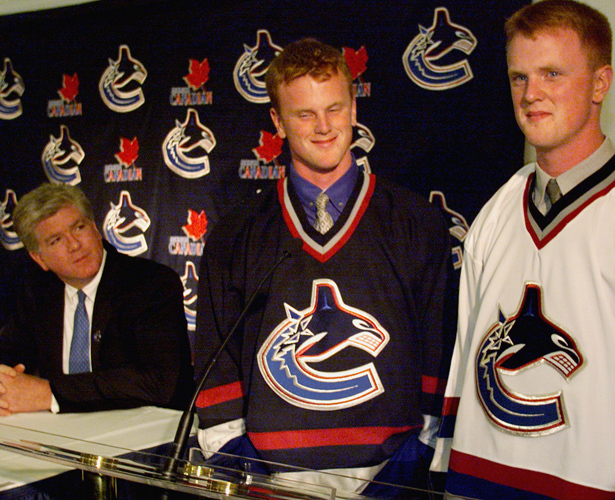 The Sedins are the most glaring example of why teams need to be patient with their young players. One seventh-round pick was used in the making of this photo. A few weeks ago I wrote an article comparing the rebuilding efforts in Edmonton and Toronto, with the basis being that there are many ways to build a team, and the traditional tank hard and draft high method isn't always a guarantee for success. 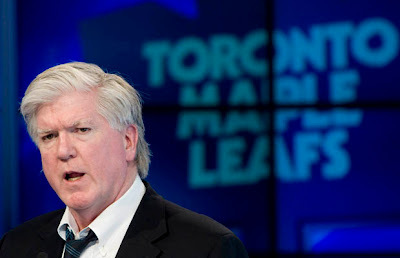 I've thought a lot about how teams go about building a contender, mainly because the Maple Leafs are so routinely whipped for Brian Burke's current rebuild, and that led me to examine the league's top two teams, the New York Rangers and the Detroit Red Wings. The last time either team had a lottery pick was in 1999, which is the year New York selected Pavel Brendl fourth overall. You have to go all the way back to 1990 for the last time the Red Wings selected in the top-5; that year they took Keith Primeau third overall. Clearly, neither team has undergone the prototypical rebuilding method, which most fans view as the only true way to create a legitimate Stanley Cup threat. Today's article at The Good Point looks at just how the Rangers and Red Wings came to sit at the top of the standings. 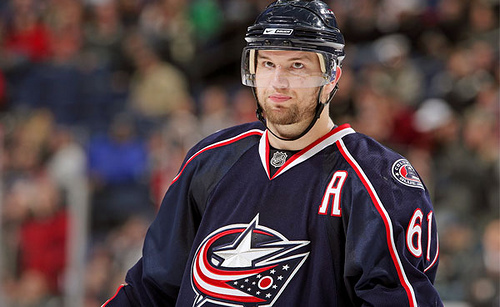 Rick Nash is on the block. After a dismal season in Columbus it appears as if the franchise winger is available at the right price, for the right team. Did you hear that? 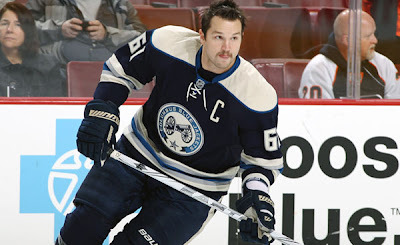 RICK NASH! First overall pick. Olympian. Maurice Richard winner. Prisoner of Columbus. That Rick Nash. On Monday, RDS reported Nash was on the market, and on Tuesday the Columbus Dispatch confirmed that the Blue Jackets were willing to listen to offers for the face of the franchise. In less than a week Nash went from untouchable to available. Things change quickly in the NHL. It's amazing that Columbus would let GM Scott Howson deal the most important player in the history of the Blue Jackets, but you don't have a perennial cellar dweller by doing things the right way. Regardless, Nash is a premier talent and teams will be lining up for his services. However, Nash has a no-movement clause, and TSN reports that he has likely given a very small list of teams that he would willingly play for. That means even if every team in the league sent a trade proposal to Howson, he immediately must disregard almost all of them, or at the very least give a quick glance and cry over potential missed opportunities. From now until the deadline, all you're going to read or hear about is Rick Nash. The prevailing thought is that any team would be crazy not to go all in on Nash. Unfortunately, it's not quite so simple. Nash would be a great fit for some teams, but not others. I'm not convinced the Maple Leafs are the former. To figure it all out I debated myself in a segment I like to call "Point/Counterpoint". Maple Leafs fans have been spoiled. That might sound funny after the team has failed to made the playoffs for eight years, but it's true. After years of lamenting the loss of Tuukka Rask, or bemoaning the missed opportunity of dealing Tomas Kaberle for Jeff Carter and a first-round pick, the Leafs' fortunes in the trade market have improved drastically. Success in the NHL came quickly and easily for Dion Phaneuf. 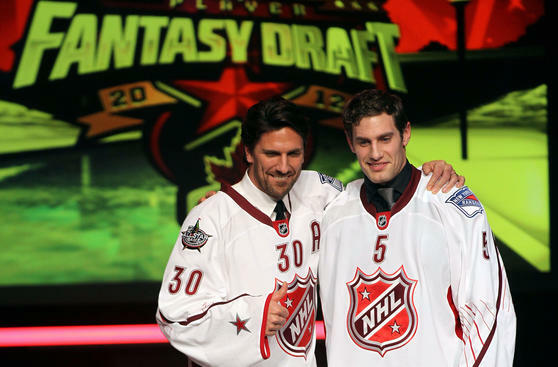 Almost immediately upon entering the league, the 9th overall pick in the 2003 NHL Entry Draft drew comparisons to both Al MacInnis and Scott Stevens for his big shot and even bigger hits. In his rookie season, Phaneuf scored 20 goals and 29 assists, firmly entrenching himself as one of the game's brightest young stars. Phaneuf improved on his point totals in the next two seasons, scoring 50 and 60 points, respectively. That third season also saw Phaneuf nominated for the Norris Trophy with Zdeno Chara and eventual winner Nicklas Lidstrom. 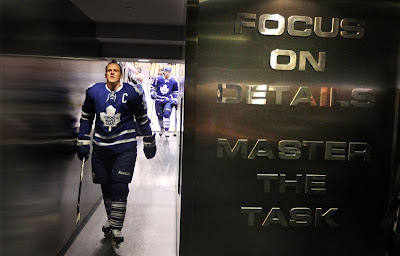 That was the beginning of what many thought would be an annual accolade for Phaneuf. The Flames certainly thought so, as they awarded Phaneuf a 6-year deal worth $6.5 million a season. Then the shine started to rub away and the Flames shipped Phaneuf to Toronto. Phaneuf hasn't scored anywhere near the level that he did when he was with the Flames, which has left many wondering if he'll ever become the dominant defenceman that everyone once predicted. In actuality, despite a decline in points, Phaneuf has actually become a far superior defenceman to the one he was in Calgary. Jonas Gustavsson didn't see his shadow. That means there will be spring hockey in Toronto. The race for the final few playoff spots is on. The Leafs are battling with a number of teams and have wavered in and out depending on the week. They had a good run in January and are in a position where they just need to keep winning at a reasonable pace, which is a nice change from the last few seasons when a .700 winning percentage was a minimum. 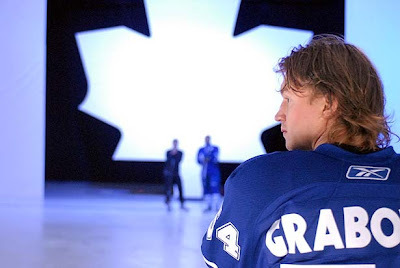 When the Maple Leafs re-signed John-Michael Liles, the prevailing thought was that Mikhail Grabovski was about to become a cap casualty. Liles took less than $4 million to stay in Toronto, putting next year's cap space at slightly over $11 million. The problem was that Keith Aulie, Cody Franson, and Nikolai Kulemin become restricted free agents in line for raises, and Jonas Gustavsson becomes an unrestricted free agent. Grabovski will likely make close to $5 million, so to keep Grabovski in the fold the Leafs need some creative cap management, especially if they hope to make other improvements to the squad. Because of the shrinking cap space and Grabovski's soon-to-be free agent status, his name has inevitably popped up in trade rumours. And unless there's some unlikely fantasy scenario where Ryan Getzlaf comes back the other way, in no way does a Grabovski deal help the Leafs.